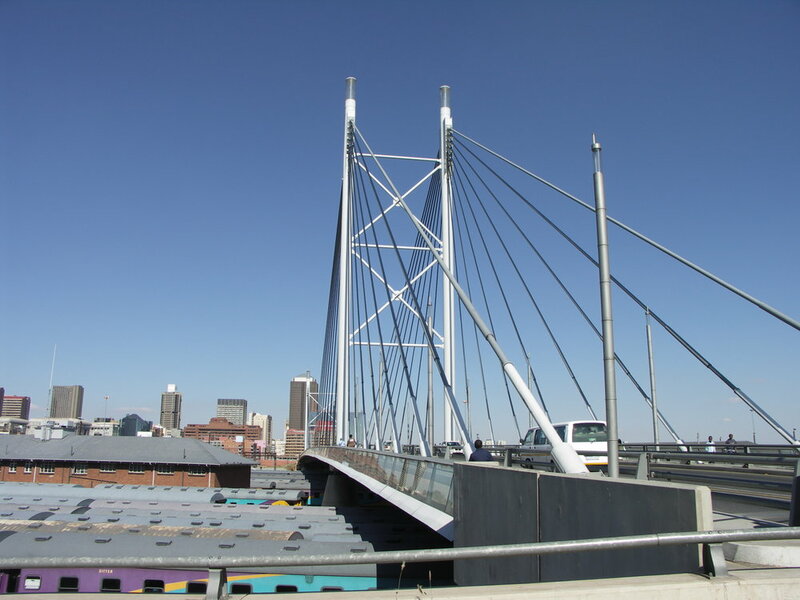 The Nelson Mandela Bridge in downtown Johannesburgh is the result of a competition won by DISSING+WEITLING architecture in 2001. 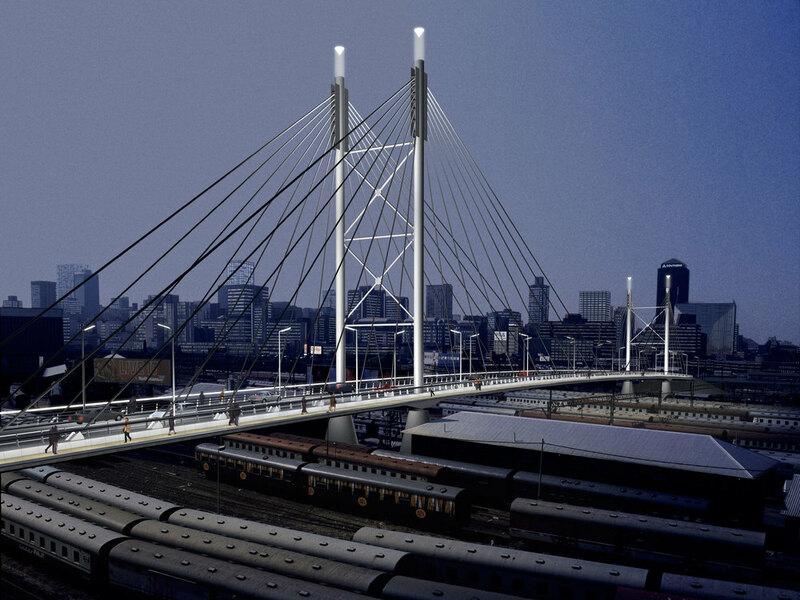 The 280-metre main span carries a motorway and pedestrian walkways over 46 railway tracks. 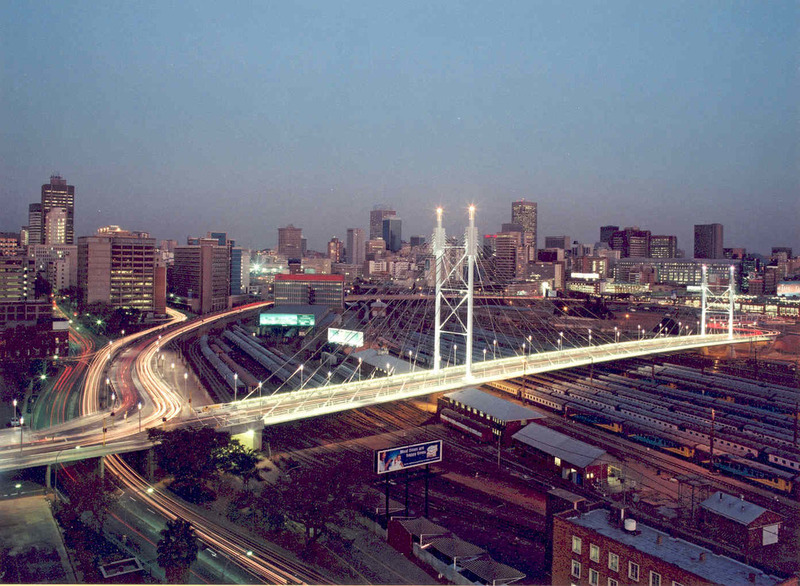 The location of the bridge carried with it a series of challenges, the resolution of which led to the award-winning design of this landmark bridge. As the deck was to be kept very narrow due to the limited space available for access ramps, the slender proportions led to the design of a cable-stayed bridge. With only two locations structurally suitable for the supports, the pylons had to be asymmetrically placed. As a result,they vary in both height and size, lending an appropriately dynamic character to the bridge. 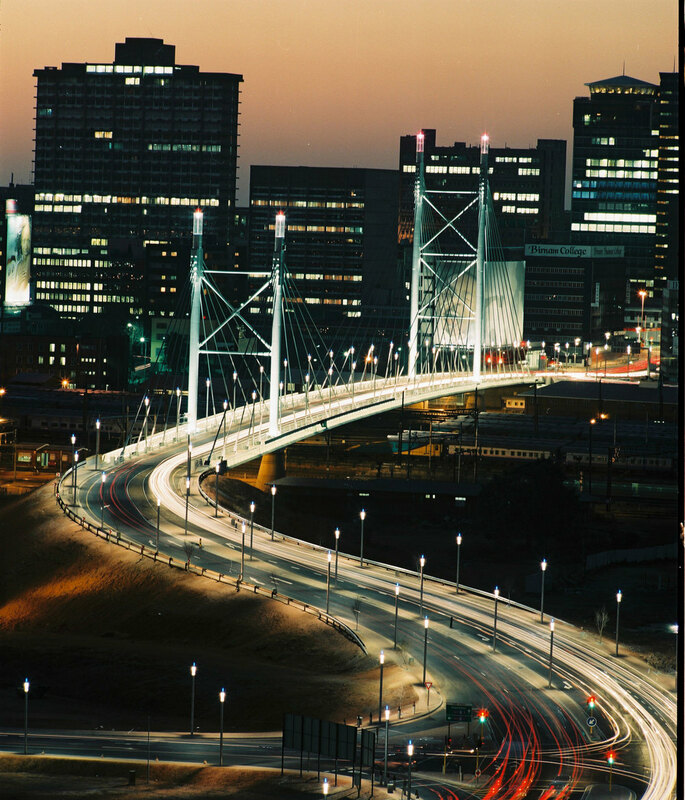 The location of the bridge also impacted the final design for the reason that security was a major consideration. The walkway guardrails have infill panels of toughened glass in order to expose potential muggers, and the walkways are brightly illuminated by integrated light fittings within the handrails. Structurally, the deck is comprised of two longitudinal steel box beams and a concrete slab supported by cross beams. Walkways on either side of the bridge are supported by steel brackets. The pylons are fabricated in tubular steel with lateral bracing. Nelson Mandela-broen er resultatet af en konkurrence som DISSING+WEITLING architecture vandt i 2001. 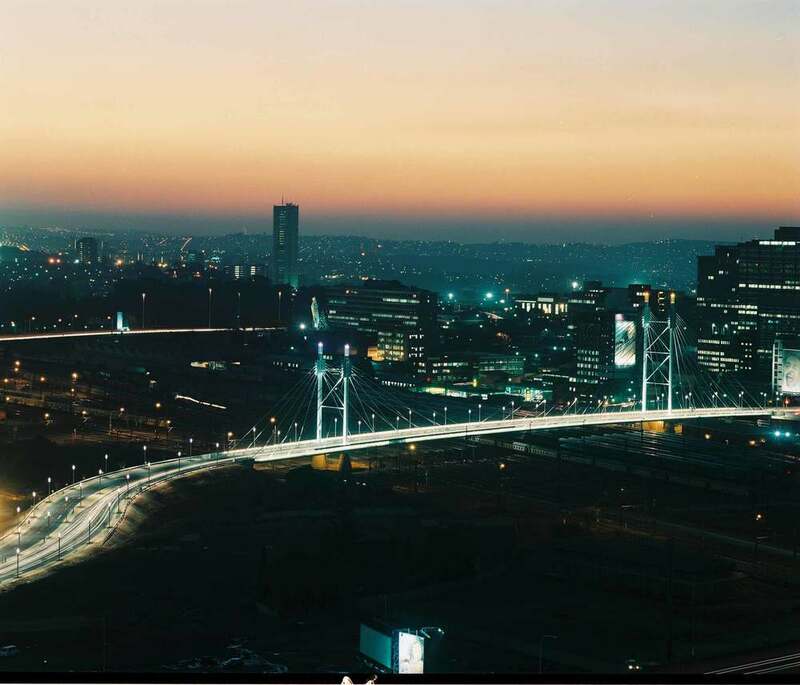 Broen er placeret i centrum af Johannesburg og strækker sig med en længde på 280 meter over 46 jernbanespor. Valget af en skråstagsbro skyldes to forhold: dels at brodækket skulle være meget smalt på grund af den begrænsede plads til tilkørselsramperne, dels at undergrunden kun to steder var egnet til at bære broens vægt, hvilket også er baggrunden for pylonernes asymmetriske placering og højde. På grund af placeringen midt i Johannesburg var det nødvendigt at tage særlig stilling til sikkerheden for broens brugere. Gangstierne er således kraftigt oplyst af armaturer indbygget i rækværket, ligesom afskærmningen er udført i hærdet glas der ikke tilbyder oplagte skjulesteder for eventuelle overfaldsmænd.